This entry was posted on Friday, October 24th, 2014 at 8:31 pm and is filed under language, spelling, typos, usage, words. You can follow any responses to this entry through the RSS 2.0 feed. You can leave a response, or trackback from your own site. Yes, this is a classic cupertino. It’s been commented on in several places over the years, including Patricia T. O’Conner and Stewart Kellerman’s Grammarphobia blog. Thanks for the links, Ben; I enjoyed revisiting your cupertino piece. I’m not surprised to see defiantly/definitely has been covered, and well, at Grammarphobia, but I am surprised by the apparent extent of the shift on Twitter: it’s near-total. Oh my word – that reminds me – at my job I keep seeing people write “insure” when we mean “ensure.” We are auditors and not insurance salespeople; we are not in the business of INSURING anything. And the best part is that I strongly suspect it’s coming from a lady who is notorious for crucifying people for every little thing that isn’t to her exact taste. I’m debating whether to use this to really embarrass her or to take the high road …. Relax. Insure has been used in this sense for more than two centuries. Ruskin used it and so did Thomas Jefferson. In the related sense “make someone sure of something, give them assurances”, it dates back to 1440. The distinction in spelling is basically artificial and has never been observed. Could there be cases of genuine ambiguity: ‘Vladimir Putin is defiantly going to attend the G-20 meeting in Australia next month’? Ooh. Nice example. I’m definitely (and, I suppose, defiantly) in the camp of not caring about spelling errors like these unless there’s an ambiguity problem. Autocorrect cupertinos are more common on Twitter thanks to the dominance of mobile devices on that platform — most of which come with autocorrect turned on by default, and it’s not always obvious how to turn it off after being mortally embarrassed by apparently idiotic tweets and emails transmitted under one’s own name. Wow. I don’t think I’ve ever heard a perspective like this before. I am inclined to agree that the miss spelling of definitely bugs me. While you’re no doubt right that the root of the mix-up is people thinking the word contains an A, which auto-correct then assumes is ‘defiantly’, I was reminded of all of this Facebook mis-spellings of ‘granted’ as ‘granite’, as in ‘I’m sick of being taken for granite’. This is something that is much more likely to happen in America because of their elision of the T. Do you think something like this could possibly be at play here? Athena: Insure = ensure is quite common in US English, and is not generally considered a mistake, I think. Some prescriptive commentators recommend or insist that insure be restricted to insurance-related contexts, but in practice usage isn’t so clear-cut. Insure “ensure” shows up even in the New Yorker, so it’s probably all right – though BrE tends to uphold the distinction. David: Yes. I considered counting 100–200 consecutive uses of defiantly on Twitter, to arrive at a sounder percentage, but I came across enough slightly ambiguous examples to decide against it. Garrett: That would explain some uses of it’s for its from people who know better. I’ve seen the iPhone blamed for this error several times. Rachel: Thanks for subscribing. I wouldn’t say the misspelling bugs me, but I do find it interesting. maceochi: “Take(n) for granite” is fairly common all right, and leads to regular sarcastic responses! I don’t know if pronunciation plays a similar (if more negligible) role in the defiantly mix-up, but “i” is not the most obvious guise for the troublesome schwa in the middle of definitely (hence *definat(e)ly, *definetly, etc.). And I wonder about the degree to which people uncertain of the spelling, having had it repeatedly autocorrected to defiantly, adopt this as the word they want, as opposed to accepting it quickly and mechanically and without active reflection. Often send their stuff in haste. If they spell like they hear it. I’d much prefer the former. Wow i did not know that people would actually misspell that word. Such a common word and we tend to mess it up. Better check to see if I also have messed it up. Thank you for the new information. I’ve seen this before, but I’ve only seen it on Twitter as well. I always assumed it was an autocorrect thing. How many hours of life did this discussion waste. Languages were made by people and all around the world their are different meanings for the same word depending on the presumption of the majorities view. So if the majority spell it that way then the meaning can change. An example of this is text messages and short spellings to mean words. Imagine if someone were using it for secrete code to another person. It would drive you people nuts. aurussanchez: You’re welcome. In casual writing at least, it’s often messed up. Peter: It seems probable that autocorrect of slight misspellings is behind this. And it may lead to real subsequent misapprehension of defiantly if users begin to take that as the actual spelling of definitely. jewelrycaddream: Yes, words change in form and meaning. But so far this is neither – it’s a misspelling or a ‘cupertino’. I’m not complaining about it, just noting it. I agree with the theory that these are autocorrections of *”definatly,” so Twitter (or Apple, if the autocorrection is being done by the iPhones on which people are accessing Twitter) should just revise their wordlist so *”definatly” autocorrects to “definitely.” Maybe we could start a letter-writing campaign to Twitter or Apple before tweeters get so accustomed to “defiantly” that the two words become forever conflated. I don’t usually use the predictive text function on my mobile phone (Samsung), so I found it and turned it on. I typed ‘definately’ and got ‘definitely’, and typed ‘definatly’ and got ‘defiantly’, so on my phone at least the issue is not only the ‘a’ but also the second ‘e’. As a test I typed definatly into an Outlook email and it’s come up with the red squiggle and two options – defiantly or definably. I then tried definately and it autocorrected to definitely, so no doubt the lack of second e is an issue. And now, typing this reply at the WordPress website, both definatly and definately have red squiggles. The first case has suggestions of defiantly, definitely then indefinably. The second gives the first option as definitely and doesn’t offer defiantly at all. So it’s not just Apple and Twitter that need letters written to them. Microsoft as usual is also an issue! John: It’s mostly observed in BrE, but I figure you’re referring only to AmE. zanyvicar: Updating the autocorrect algorithm would radically improve the word’s spelling overnight, though I don’t know if a letter-writing campaign would work (and I’m too interested to see how this plays out). David: My phone does the same, more or less: definatly becomes defiantly and definately becomes definitely (or in some programs is just underlined, with the suggestions definitely, define rely and defines rely). I see ‘defiantly’ for ‘definitely’ quite frequently in student papers written using Word. I haven’t measured the rate precisely but it’s common enough that I’m skeptical of it being a mobile phone issue. I’m wondering if it has become common enough that it doesn’t look “off” to writers, particularly ones who don’t use ‘defiant’ anyway. Stuart: Ambiguity is only occasional, but given the choice I’d like defiantly to hold its place in general usage and not be confused with the more common word. Katdogsoz: Yes, it seems to prevail in informal digital communication – wherever autocorrect is used and spelling skills are patchy. Bill: It doesn’t surprise me that it’s cropping up in unedited Word documents. I’ve yet to see it there, but then I mostly edit texts from older students and businesses. I imagine it’s predominantly a mobile phone issue, given the quantity of texts and tweets, etc. sent in that medium, but the error seems apt to occur anywhere autocorrect does. Popping up again a bit late: spelling suggesters work on the basis of edit distance; a known word is considered more likely to be the correct spelling of an unknown word if fewer edits (changed, deleted, or inserted letters) are required to generate it from the unknown (presumed misspelled) word. Some suggesters also take into account keyboard distance (transpositions of adjacent keys are more likely than transpositions of distant ones, for example) when ranking options. Thus, in most algorithms, a correct spelling that differs from the input by two edits (one letter missing and one letter changed) is less likely than a correct spelling that differs from the input in only one edit (a single transposition). Thanks, Garrett. I had wondered about how autocorrect worked, and this is a very helpful basic primer. The idea of ‘edit distance’, which I had intuited but only vaguely, explains a lot. 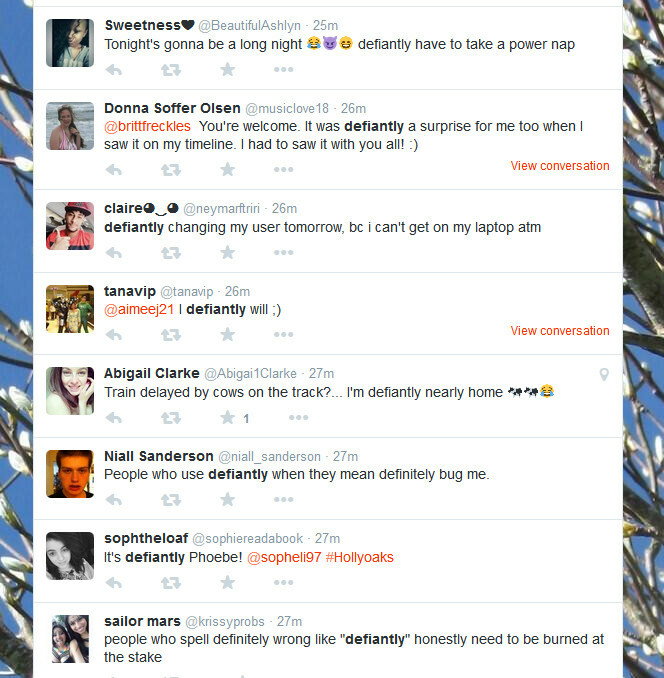 I think ‘definately’ would come out on top of a misspelling survey. Heck, I used to do it myself, until a few years ago, but I’ve definitely learned my lesson. Sean: It would definitely be there or thereabouts in any good survey of common misspellings. That second ‘i’ just isn’t very guessable. “Some girls should defiantly dress for the body they have and not the body they want..
Lauren: Right, that one works both ways. But it shouldn’t.